Week two of the Will & Grace revival is a certain improvement from last week, although it would be extremely difficult to top the tone-deafness of that opening clunker. Not that “Who’s Your Daddy?” immediately vaults the show back to its Emmy-winning heyday, but it’s getting there. The boys and girls spin off into separate plots this week, as we get to see what their modern-day dating life is like for Will and Jack, while Grace and Karen revisit a fight they’ve been having since olden times. It seems like the shower scene is an attempt for W&G to visit the slapstick it’s famous for, while maybe evoking a bit of Lucy and Ethel hijinks along the way. At any rate, it falls far short. For several reasons. First of all, it makes no sense. Why would someone program their shower to lock forever? Besides, all Grace and Karen would have to do, in that house full of staff, is to have someone yell loudly to come save them, right? But even beyond the setting and the circumstances, the fight is stupid. It’s been established from the very beginning of the series that of course Karen does nothing at the office, but through her connections she hooks Grace up with important clients. Maybe it’s a reminder for new viewers of the show, but it’s gratuitous for anyone who has happened to ever see W&G before. Megan Mullally, bless her, seemed to at least be having fun in the water tank, grabbing Debra Messing with her legs and somehow keeping her shoes on, but the whole thing seemed way more stunt-like than hilariously outlandish. They almost drowned two of the leads in a shower? What’s up next week, bungee-jumping off of Will’s terrace? Much more agreeable was Jack and Will and their adventures at the Cockpit. Jack’s bodily distortions with the magnets was the kind of physical humor the show excels at. Naturally, two middle-aged men like Jack and Will are going to be concerned about appearances in the dating pool, even though they both look amazing (Jack’s made-up Gloria Swanson was appropriately and hilariously terrifying). 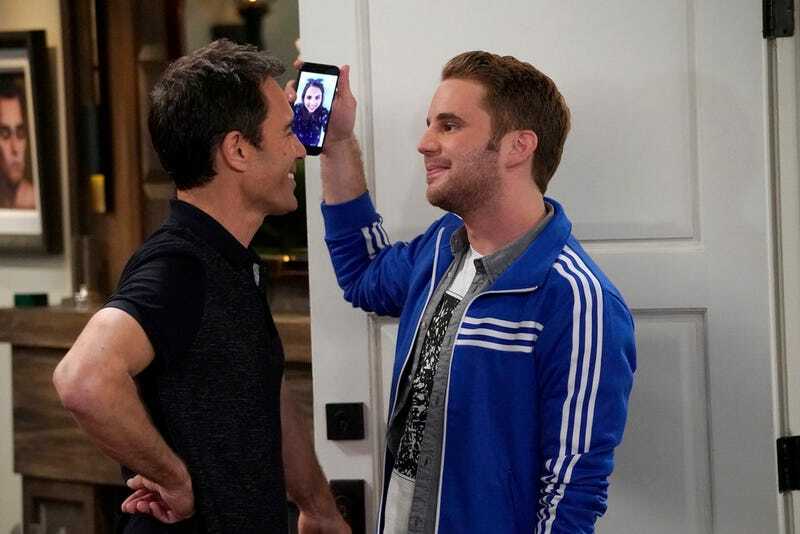 But best of all was Pitch Perfect and Broadway’s Dear Evan Hansen star Ben Platt to help underline the difference between Will & Grace of 1998 versus Will & Grace of 2017. Will’s rant got a bit preachy, but in this instance, I’ll allow it. (Bonus points for aligning the rant with a similar speech Dixie Carter might make on Designing Women.) It is crucial to remember how all those gay rights strides were made and how easily they could be taken away (The recent ABC mini-series When We Rise did an impressive job covering many significant LGBTQ milestones). As someone who got two competing coming-out parties from his parents, young Blake should be aware of that history, and respectful to the brave men and women who made so many inroads before him. And everyone should respect Madonna just for being a badass, even if she’s now cut like Iggy Pop. But Ben’s millennial stances—holding up the phone so his version of Grace could see his date; generally being more happy, less angsty with his life and who he is—were a needed sharp contrast against Will’s extra decades. Will’s income, his more lavish lifestyle, even his lack of social media are just a few of the things that can set a gay man of 50 apart from a gay man half that age, and the show’s take on those differences was interesting and insightful. Much more of this, please. Fewer Cheeto jokes (sorry, I’m just still not over it). Will asks Jack if Grace is right that it’s gross that he’s dating a 23-year-old: She didn’t say that, right? It’s likely a scene or line that got cut? Pretty cruel to mention Rosario and then not even have her make an appearance, show. Except if it leads us back to that original pairing, this time in a romantic fashion. That’s certainly what that end scene was hinting at, right? The coupling of Jack and Will? At first glance, that seems nothing like a horrible idea. Like when Seinfeld briefly tried to pair Jerry and Elaine. They wouldn’t do that to us, would they? I dunno; I also was dreading the Chandler and Monica pairing, and wound up loving it. But Jack and Will? What do you think? This week in “Do I hate Grace’s outfit as much as Karen does?”: Yeah, kind of. The peekaboo sleeves were ick. Next week: The welcome return of Harry Connick Jr., so that we at least know what happened with one of the title pair’s exes.